Shuvam Kumar lay on an iron cot in the tetanus ward of the Nalanda Medical College and Hospital in Patna, Bihar. After four days in the hospital, with stiff jaws and high fever, the two-yearold was too weak to cry when the nurse gave him an injection. There is little hope left of his survival, the family had been informed. His father, a labourer in Galurghat village in Gaya, regrets not getting Shuvam to Patna for the tetanus vaccine immediately after he stepped on a nail in the village. Shuvam was not administered the vaccine after birth either. The vaccine is not available in the village. Rickshaw pullers outside the hospital refer to the tetanus ward as the bachcha murda ghar (morgue for children). Last year, 700 patients suffering from tetanus, diphtheria and whooping cough were admitted to the hospital. 300 died. The deaths happened because as infants they were not given the essential vaccines, the head nurse said as she stacked the patient record register among other files in a rusted iron rack (see box: Universal Immunization Programme). Overall, there is no reliable data on the number of deaths due to vaccine-preventable diseases in India. Back at the ward, a resident doctor said they expect more such patients. The health ministry had shut its public sector vaccine-manufacturing units. “There are some sectors the government should stay invested in. Vaccination requires free distribution. Private companies are driven by profit, not welfare,” said Sunil Aggrawal, the doctor. Suspension of the manufacturing licences of the units on January 15, 2008 resulted in shortage of vaccines (see box: Vaccine shortage in India). The ministry’s choice was private players. But that did not work. In October 2008, Panabaka Lakshmi, former minister of state for health and family welfare, said private vaccine manufacturers had enough capacity to meet the requirement of India’s immunization programme. But there were problems in procurement, she said in the Rajya Sabha. Shortage of vaccines was rampant between April and December. The former health minister Anbumani Ramadoss admitted this in Parliament in December. What he did not mention was the ministry had to go back to the public sector to end the shortage. Down To Earth (DTE) learned this through a Right to Information (RTI) application. Why did the health ministry target the three units that meet 80 per cent of the vaccine requirement of the Universal Immunization Programme? It was a move to protect business. The three units that got suspension letters were: Central Research Institute (CRI) in Kasauli, Himachal Pradesh; BCG Vaccine Laboratory (BCGVL) in Chennai and Pasteur Institute of India (PII), Coonoor, both in Tamil Nadu. An inspection, by a team comprising WHO and health ministry officials, found the units did not meet the good manufacturing practices of the WHO and pointed out several deficiencies in these units. This put a question mark on the ability of the National Regulatory Authority to monitor the industry. The National Regulatory Authority is a body under the health ministry that grants or cancels licences to vaccine manufacturers (see box: India’s vaccine checks). Meeting WHO standards makes business sense for India. WHO certification helps procurement agencies like the UNICEF assess the quality of vaccines for immunization programmes the world over. 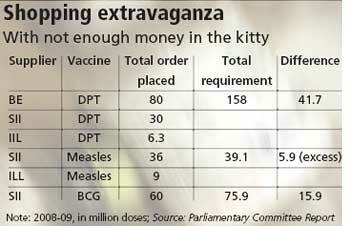 About 60 per cent of the world’s vaccine supplies are from India. Allowing the units to continue could lead to disqualification for export of vaccines to the tune of Rs 1,500 crore, said Naresh Dayal, secretary, ministry of health and family welfare, at a press meet. Disqualification would have serious impact on export of other drugs as well. It could mean losses of around Rs 24,000 crore annually, Dayal added. A parliamentary standing committee on health and family welfare, formed in July 2008, looked into the suspension decision. It said there were gaps in the ministry’s logic of shutting down the units and recommended the units should be restarted. Its report, submitted in February this year, raised questions on the procurement in 2008-09. The report said the ministry had distributed vaccine orders among three manufacturers at random: Serum Institute of India in Pune, Biological Evans and Indian Immunologicals Limited (IIL) in Hyderabad. IIL is a public sector enterprise under the National Dairy Development Board. The parliamentary committee said a chunk of the orders were given to Biological Evans, whose good manufacturing practices’ status was not clear. A note dated February 13, 2009, prepared by Sujaya Krishnan, director of the empowered procurement wing of the ministry, said private manufacturers had hiked prices and not supported the nation during a crisis. The government had of course not factored this in while suspending the licences. 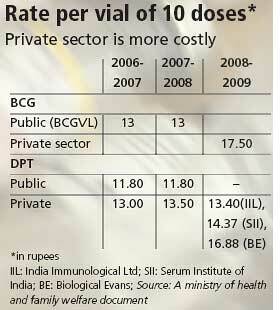 It reduced the procurement budget for vaccines from Rs 140 crore in 2007-08 to Rs 138 crore in 2008-09. According to C M Gulhati, editor of Monthly Index of Medical Specialities, the move is a conspiracy to include private companies into the business of vaccines for the Universal Immunization Programme. Bribes, he said, are not possible from the public sector. On December 23, 2008, the prime minister’s office (PMO) had questioned the ministry. Left leader T K Rangarajan had sent the questions to the PMO. He raised the issue of additional costs of the vaccine procured from private players and impact of the closure on the Universal Immunization Programme. He also wanted to know if any effort was made to revive and make the public sector compliant with WHO’s good manufacturing practices. The PMO asked the ministry for a reply by December 29, but hasn’t got any response yet. “We want an inquiry. We are not looking for character assassination of the health minister,” said Rangarajan. The health ministry did not give answers to most questions and diverted them to different departments. The two pages of response it sent, however, revealed the extent of the crisis: it had (illegally) procured 11.7 million doses of DPT, 3.7 million doses of DT and 12 million doses of TT from CRI in 2008-09. The ministry also approached BCGVL for vaccines but the unit turned it away. The unit’s director revealed this in an affidavit, which he gave in response to a petition filed by public health experts in the Supreme Court (see box: Allegations against former health minister). Despite the crisis now, the ministry only has long-term plans. It has commissioned HLL Lifecare Limited a Rs 900- crore Integrated Vaccine Complex in Chengalpattu, near Chennai. HLL is a public sector unit with no experience in vaccine manufacture. The ministry plans to make the complex compliant to WHO’s good manufacturing practices. “HLL would own the facility, manufacture and supply high quality vaccines at affordable prices to the government,” said K R S Krishnan, executive director of the company. The complex will manufacture vaccines for India’s vaccination programme along with new generation vaccines. For conventional vaccines, the technology would be sourced from the public sector. For the rest, it would enter into partnerships with the private and public sector and companies in India and abroad. The complex is likely to be completed in 2011. In the first phase, bulk vaccines procured from private manufacturers will be repackaged. There is no timeline for manufacturing yet but the company claims its prices would match the lowest in the market. “Five years from now,” said Krishnan, “our prices would be 50 per cent of UNICEF’s procurement prices.” He refused to divulge price details. The question public health experts are asking is if the vaccine complex can meet the good manufacturing practices, why can’t the same be done for the existing public sector facilities in India. In fact, after inspecting the public sector manufacturing units, WHO had offered funds and technical support to the ministry. The assistance was to make the units compliant to its good manufacturing practices. The parliamentary committee in its report had asked the ministry why it did not take the offer then. In 1997, CRI Kasauli had submitted a proposal to the health ministry to upgrade its DPT vaccine laboratory to good manufacturing practices. The ministry commissioned the work to HSCC Ltd, a consultancy firm in Noida. Nine years later, its chairperson met the health secretary and said the firm did not have the expertise for the project. This after the ministry had given the company Rs 11.86 crore of the Rs 13.29 crore sanctioned for the project. CRI then sent a fresh proposal to the ministry and the director general of health services on December 3, 2007. The proposal was forwarded to the drugs controller general of India for comments on January 30, 2008, but the suspension order was out by then. It’s no surprise that the institute was operating without a director since 1997 and faced a staff shortage of 24.3 per cent, including scientists. There was a 27 per cent staff shortage in BCGVL, mostly in the technical field. By July 2008, the institute had spent Rs 1.2 crore, renovated some of the facilities, which addressed the deficiencies pointed out by WHO. They needed another six crore rupees and one more year to complete the work, but the ministry had not shown any interest in reviving the unit. Questions on revival of the units in Parliament received no responses last year. In February, Lakshmi acknowledged they received a proposal to upgrade facilities at CRI Kasauli. WHO experts had examined it and said the plan was feasible. She added that production of vaccines could restart after complying with WHO’s good manufacturing practices. But sources said the whole of CRI is not being revived. The DPT unit has received more than Rs 250 crore. WHO wants the new facility completed by November this year. Similar plans are being made for PII and BCGVL . Work has barely begun at CRI. The units will start providing vaccines after they meet good manufacturing practices. The process is likely to take long and until then India is at the mercy of the private sector. Delicensing public sector has another advantage. Agencies like the World Bank and the Asian Development Bank provide funds to vaccine manufacturers to meet good manufacturing practices. These are available only when WHO has certified the National Regulatory Authority. If the public sector does not exist, the money goes to private players. V M Katoch, director of the Indian Council of Medical Research, said public sector units serve the nation well. The new health minister Ghulam Nabi Azad has been briefed on the subject. This is not India’s first attempt to kill a public sector enterprise. In 1997, the government had stopped production of the polio vaccine at PII in Coonoor because there were questions on the vaccine’s quality. Vaccine production at Haffkine Institute, Mumbai, was also stopped. Like the Integrated Vaccine Complex planned in Chengalpattu, the department of biotechnology set up a public sector facility, Bharat Immuno logicals and Biologicals Corporation Ltd, to meet the polio vaccine requirement. In its first phase, the company imported bulk of oral polio vaccine from Russia. It was supposed to repackage them and begin manufacturing in five years. The government declared the company a sick unit in 2000. India now imports polio vaccine from Indonesia and Italy and repackages them. Little has changed since. There are new victims. Shuvam Kumar, among them, continues to be in a critical state at the Patna hospital. 25 million newborns are at risk every year.